Fresh, sweet pears have always been a favorite of mine. 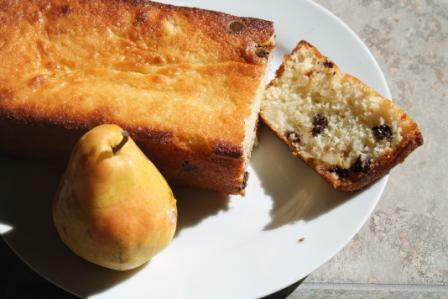 Rarely have I baked with pears but this recipe sounded too delicious to resist. It has a wonderful texture and so very moist! 1/2 cup bittersweet (dark) chocolate chunks. Preheat your oven to 350F and grease an 8 inch loaf pan with butter (I found the recipe made too much for one loaf pan–I made an 8 inch loaf and a small loaf pan). In a small bowl combine all the dry ingredients (flour through salt). In medium bowl, whisk together the sugar, yogurt, eggs and vanilla until smooth. Then, stir in the dry ingredients, a bit at a time, until well blended. Finally, use a rubber scraper to fold the oil into the batter until it is fully incorporated. Pour about one-third of the batter into the greased loaf pan. Sprinkle 2/3s of the pear pieces and the chocolate chunks all over the batter. Then, scrape the rest of the batter on top of this and gently spread it smooth. Sprinkle the rest of the pear and chocolate over the top of the loaf and gently press all the pieces down into the batter to partially submerge them. Bake in the middle of the oven until a toothpick inserted into the cake comes out clean – 55-60 minutes or so. Then, take the cake out of the oven and let it sit for about 5 minutes. Run a knife around the edge of the pan to loosen the cake. Carefully turn the cake out of the pan, and then put it upright on a cooling rack to cool the rest of the way. Serve slightly warm or at room temperature. The cake will keep for several days (refrigerate if it’s more than 2 days), and slices are delicious lightly toasted before eating. Serve with sweetened whipped cream.